Common skin issues include eczema, acne and age spots. Usually each of these issues, as well as others, all have their separate lotions or treatments to apply in order to get relief. But what if indeed there was a one-size-fits-all treatment that is not only effective for several skin issues, but is all natural as well? Apple cider vinegar is just that. Most people have used ACV (Apple Cider Vinegar) as part of a recipe while cooking. But ACV actually has pH properties, natural alpha-hydroxy acids and acetic acid which can provide soothing and repairing qualities for the skin. 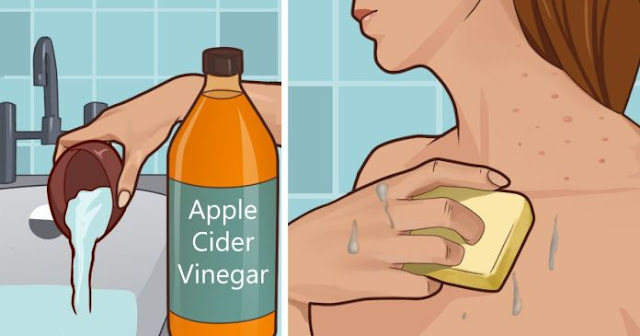 Why use apple cider vinegar on skin? Anything from moderate dry skin to psoriasis has been treated with ACV and the results have been great. Since the pH level is very similar to human skin, it allows the vinegar to both soothe and dry itchy and irritated skin. Pores are also minimized and skin is tightened due to the natural acids that ACV also has. ACV naturally contains alpha-hydroxy acids. These can gently remove dead skin cells and with regular use they can reduce those unsightly aging spots. Application: Just take straight up ACV and apply it directly to the age spots using a cotton ball or soft pad. Blot it on the affected area, then let it set for 30 minutes. Repeat this twice a day and continue for up to six weeks. ACV contains malic acid and this works as a wonderful facial cleanser. It naturally soothes skin and serves as an antifungal/antibacterial cleaning agent as well! Application: Take a small amount of ACV and use it to rinse the skin. Then rinse thoroughly with water. ACV has some great astringent properties which can minimize pores while improving skin circulation. This makes it an ideal natural skin toner. Application: Take a ½ cup of water and a ½ cup of ACV. Then add a few drops of lavender oil. Now you want to apply this directly to the skin using a cotton ball. Allow to set for two minutes, then rinse with fresh water. You can repeat this process twice daily max. Give the aloe vera a rest and try some ACV for sunburn relief! It’s a natural astringent which speeds up recovery and reduces the usual itching and burning which occurs with sunburns. Application: Mix up equal amounts of cool water and ACV. Then you want to apply it directly to the skin. Just rub it on the burnt skin gently. Repeat this several times a day as needed. • Skin issues will vary and some may be very severe. Thus a more serious and rigorous regimen will be needed. Antibiotics could be required if the skin condition has led to infection. • ACV shouldn’t be used on open wounds as there are chances of an allergic reaction which will usually be rash, swelling, or having trouble breathing. • In some instances, skin conditions could be made worse! ACV may cause a burning sensation and could inflame the skin. Always seek advice of medical pro’s before using any treatments, even natural ones and especially if any of the above issues arise.